This entry was posted on March 18, 2019 by Emily Turner. Perfect for simple and low-cost AGV applications, AGV guiding by magnetic tape has become more widely used in recent years. The magnetic tape can be installed quickly and easily by the system operator and the track can be modified later. These days, the Automated Guided Vehicle (AGV) is utilised in nearly every industry. They can benefit industries from factory assembly to warehouse inventory control. For many, the AGV has become an indispensable part of the control process. Unfortunately, the high cost and complexity of many typical AGV’s has precluded their use in smaller industries. It is these SME's which could greatly benefit from their usage. An automated guided vehicle (AGV) can be built with as little as two components available in our product range: an MGS1600GY magnetic guide sensor, and one of the many dual channel motor controllers available from our Roboteq range. Roboteq’s application notes refer to using a MDC2260 dual channel motor, the updated version of which is the MDC2460. Roboteq’s magnetic guide sensor can detect and report the position of a magnetic field along its horizontal axis. The sensor is intended for line following robotic applications, such as AGVs, using adhesive magnetic tape to form a track guide on the floor. To address the important issue of cost, and prove that an AGV can be built for a reasonable price using Roboteq’s solutions, Engineers at Roboteq have developed an ultra-low cost AGV demonstrator called RoboCart. This robot is ideally suited to transporting lightweight materials, for example food, linen or medicine in hospitals. 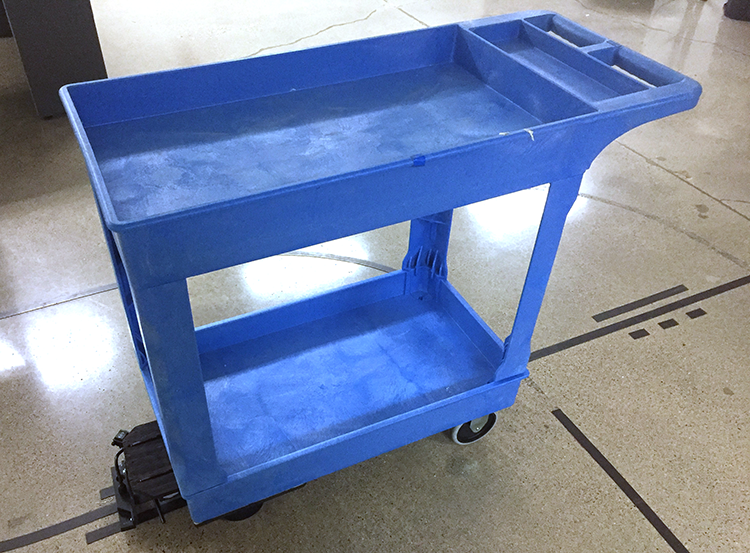 The development of an inexpensive, but highly capable AGV Cart for small business and light industry is a game changer. It enables nearly limitless applications in both the service industries and small companies.